Next time your searching for a healthy snack, grab a handful of walnuts. We already know that consuming walnuts is healthy, but a recent study cites even more reasons why walnuts are beneficial to our health. Not only are walnuts high in protein, low in cholesterol, and high in healthy fat, but eating walnut daily can significantly lower LDL cholesterol (bad cholesterol). 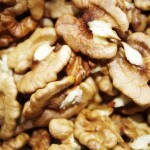 The omega-3 in walnuts can also help reduce cholesterol and aid with the beneficial, good intestinal bacteria. Compared to other nuts like cashews, almonds, and pecans, walnuts are high in polyunsaturated fat.